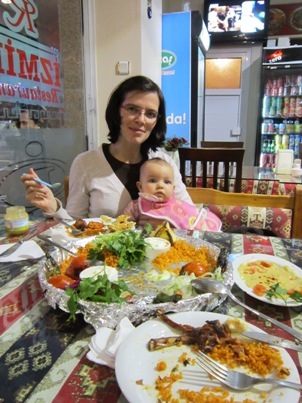 Erynn and I have always wanted to visit both Istanbul and Dubai ever since we lived in England. However, we never got around to it since we spent most of our 2.5 years traveling around western Europe. Now that we live in Germany we are now trying to hit the rest of the places on our "list." Therefore, for our Christmas holiday we decided to hit both Istanbul and Dubai. Turkish Airlines flies from Frankfurt and we bought a round trip ticket to Dubai with a 4 day layover in Istanbul. 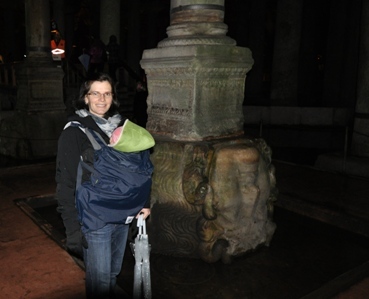 This trip was also our first super holiday with Greta. All previous trips were mostly by car where we could pack tons of stuff or to the US and home (lots of family support). She had her 6 month birthday during the trip and she did great the entire time. It also happened that Turkey was the 12th country she visited and the United Arab Emirates was her 13th. You can check her progress here. Not too shabby for a 6 month old! The two countries are both predominantly Muslim, but I don't think they could be much more different. At least from our limited exposure and itineraries. 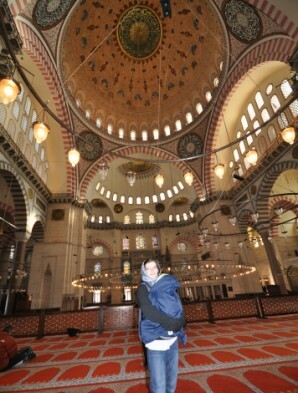 We spent all of our time in Istanbul in the Old City with its thousand year old mosques. 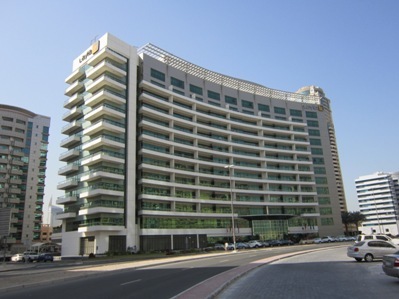 While Dubai really didn't expand from its Bedouin roots until the 1960's after the discovery of oil. Dubai now feels like a cross between Las Vegas and New York City. Both were special and amazing in their own right, and we enjoyed our time immensely. 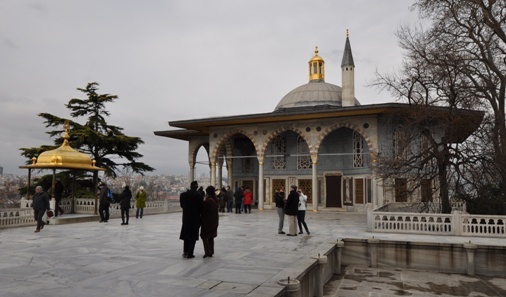 Our daily itinerary for Istanbul had us see pretty much all of the historical sites in the older parts of town. 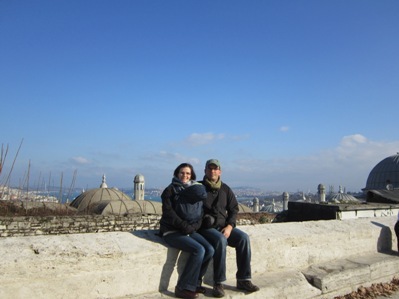 We spent our entire time on the European side of the Bosporus Strait, and didn't venture over the bridge to Asia. We took basically four days to see everything you could do in 2 if you pushed. However, with a small baby we wanted to make sure we had enough time. Greta did great and we were able to see everything and relax at the same time! The first couple days we were in town it rained and was cold. In fact, it was unseasonably cold the entire time. 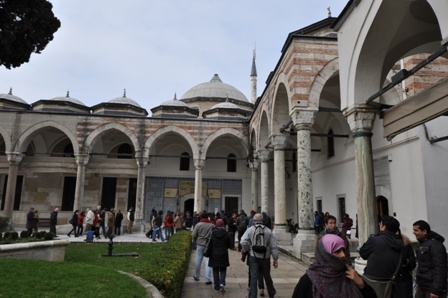 So the first part of the trip we tried to do stuff that was inside so our first stops were the Blue Mosque (Sultan Ahmed Mosque) and Hagia Sophia (Ayasofya). 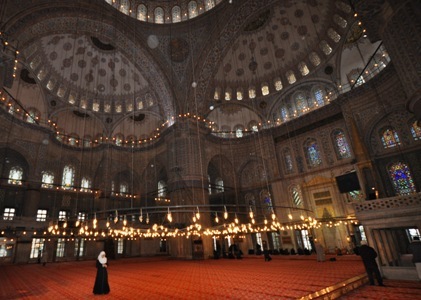 The photos above show the Blue Mosque. We got pretty lucky because they were closing for prayers so we got in, snapped a few photos, and were herded out again. 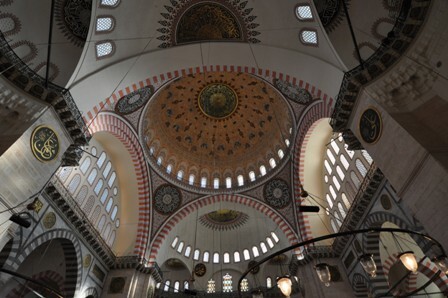 The interior space is incredible and gets its nickname from the fabulous blue tiles lining the interior walls. 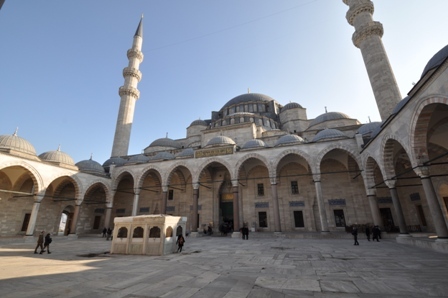 It is also very distinctive due to its six minarets. 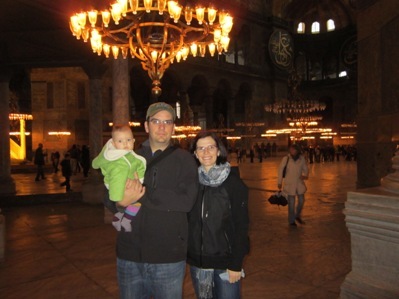 We stayed at the Mina Hotel in the Sultanahmet area. From the roof we had a great view of the Blue Mosque as well (Erynn says you should click on this link...). 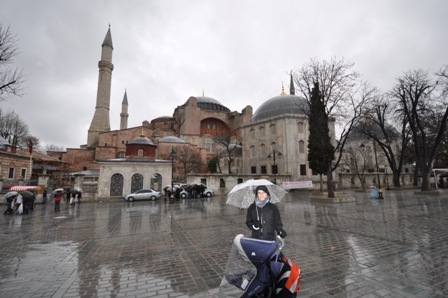 Right next to the Blue Mosque is the Hagia Sophia, which started out life in 537 AD (!) 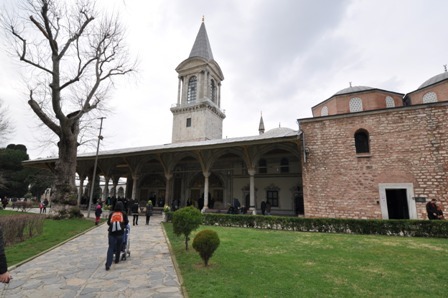 as a Byzantine church and then was converted to a mosque in 1453. It is now a museum. Let the dates I just mentioned sink in a bit... the current dome you see was finished over 1500 years ago and was the largest building in the world for over 1000 years! This building was probably the coolest thing we saw on the trip. We spent a long time walking around on the ground floor and observation gallery. 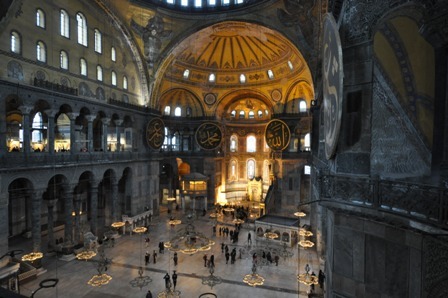 On the observation gallery there are a number of Byzantine mosaics that are amazing. I've only put a few of the photos on this page. 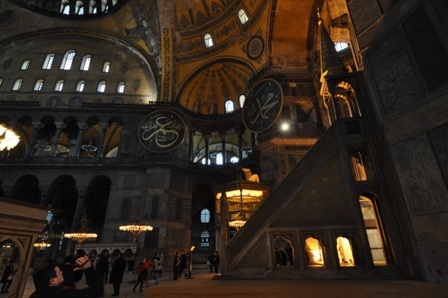 Remember that if you want to see a ton of high resolution photos from Istanbul click here. 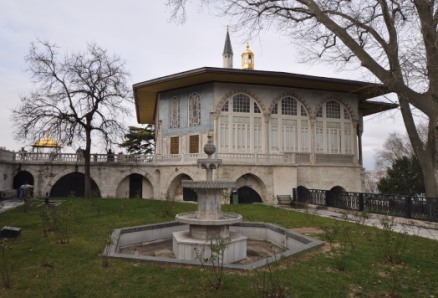 The last major site in the Sultanahmet area is the Topkapı Palace (this link does a great job describing the palace), which is connected to the Hagia Sophia via the Imperial Gate. 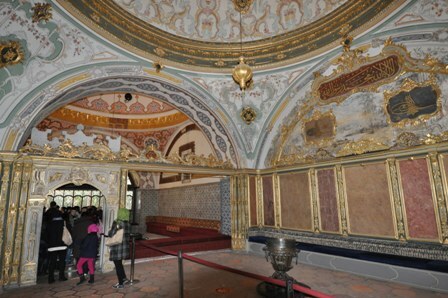 The Palace is a collection of buildings split between the public section and private section (Harem) just like other royal palaces. Photo clockwise from upper left: The Gate of Felicity; The Third Courtyard showing the The Conqueror's Pavillon standing at the exit of the Audience Chamber; Erynn on the palace terrace overlooking the Bosporus; and the Privy Chamber - no photos inside but contains a huge number of sacred religious relics. 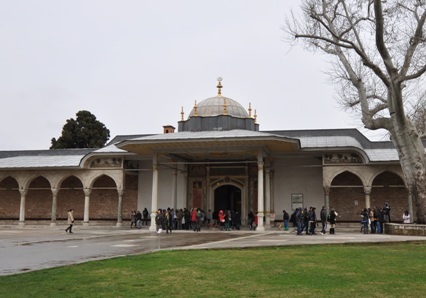 The area of Topkapı Palace I particularly liked was the Baghdad Kiosk (upper photos) and İftar Pavilion (lower photos). 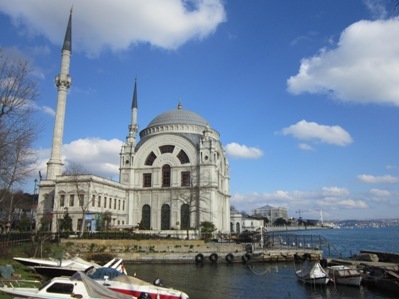 The buildings were very nice and there was a good view of the Golden Horn. 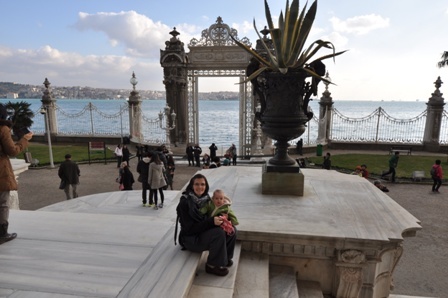 On our way out of the Topkapı Palace we stopped at the Imperial Council Hall, which is the low building in front of the Tower of Justice. 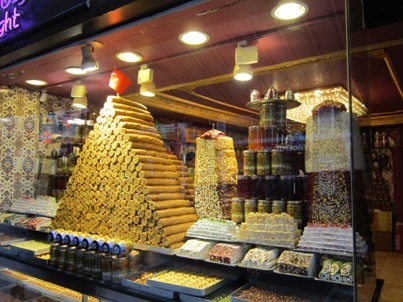 Almost everything you see in the Istanbul section was within walking distance of our hotel. Other stuff was easily accessible via the tram that was also a few hundred meters from the hotel. 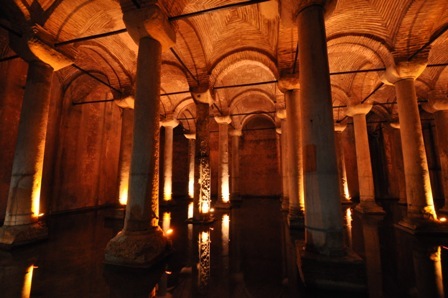 Across the road from the Hagia Sophia was the entrance to the Basilica Cistern, which was a water collection system for city of Istanbul in the 500's AD. 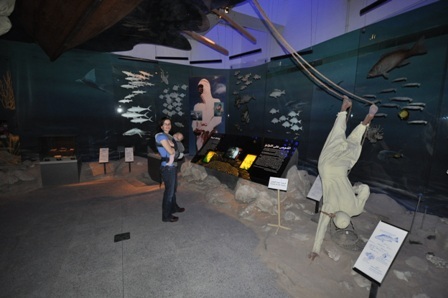 It was "re-discovered" and made into a museum and opened to the public in the 1980's. During the construction many pieces were scavenged from other parts of the city including a couple Medusa column bases. 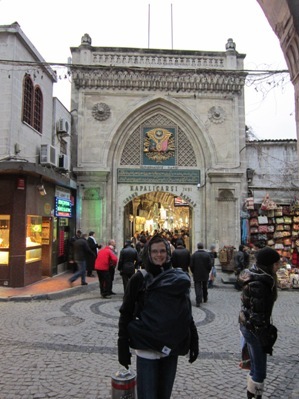 One evening we decided to walk around the Grand Bazaar. 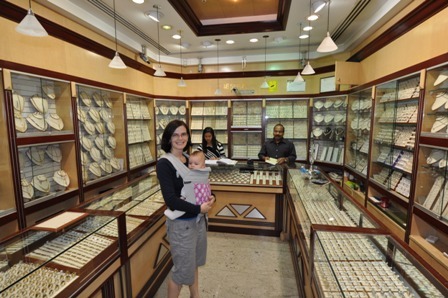 This was our first experience with a souk so we didn't know what to expect. It was very crowded and divided into rough sections specializing in different types of merchandise. 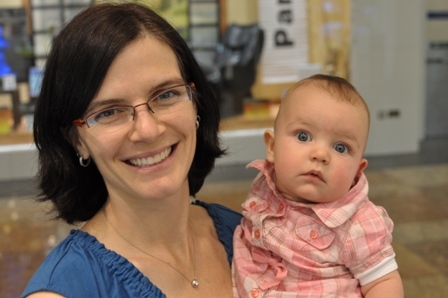 Some observations were that 99% of the people working were men and they love babies. I was wearing my Alaska hat and become known in all of the markets as "Hey Alaska, do you want to buy something?" Also, Greta got a fair amount of attention from the men. They all cooed and said hello, which was endearing at first, but after a couple hours was just a little creepy. We soon realized it was just another ploy to try and get us to look at their merchandise. All in all it was pretty cool walking through the bazaar, but we didn't buy anything since most of it was tourist crap. One thing that's fun to do is take one of the open top tour buses around a city. We find it to be a good, fast, and cheap way to quickly get the "lay of the land." It then helps with building the rest of the holiday itinerary. 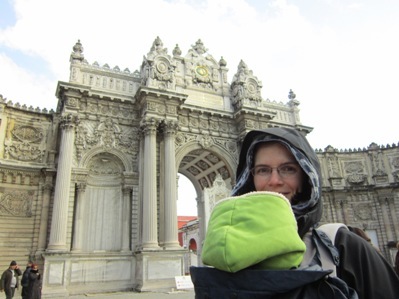 On about our third day we took the bus to the Dolmabahçe Palace on the other side of the Golden Horn. 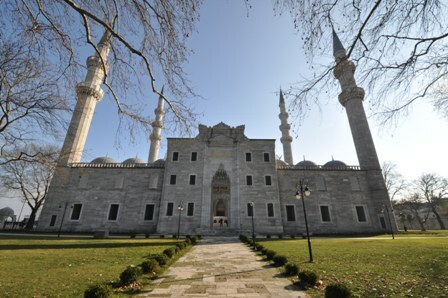 On the site is the Dolmabahçe Mosque (left photo) and the Palace itself. 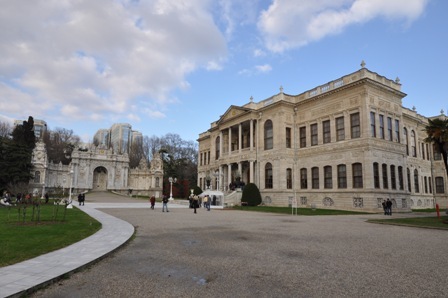 The Palace was used in the 19th century instead of the Topkapı Palace for housing the sultans. In the right photo you can see Erynn and Greta in front of the clock tower at the visitor entrance to the palace. The palace is ridiculously ornate. 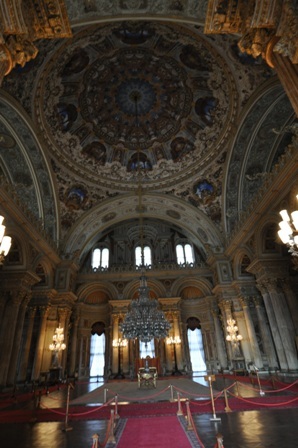 It also seems quite large, but I guess it really isn't compared to other European palaces. Here you can see Erynn and Greta in front of the Treasury Door on the left. 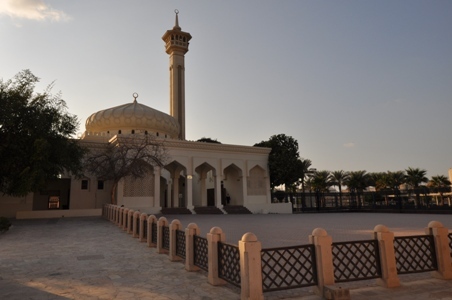 In the right photo is the main courtyard in front of the Palace Entrance (building on right) and Sultanat Door (center left). At the exit I also snapped this great photo of Erynn and Greta on the steps to the Muayede Hall. 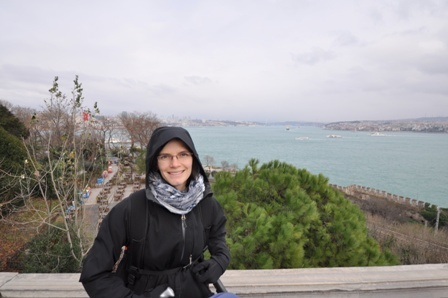 The weather wasn't perfect, but on a super clear day the views of the Asian side of Istanbul and the Bosporus would be amazing. 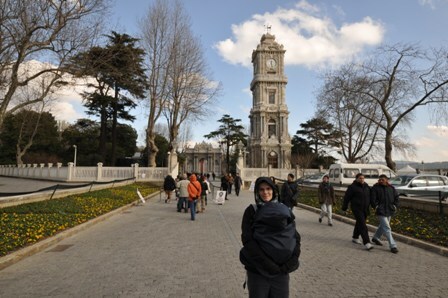 On our last day in town we hopped on the Metro to the Sirkeci stop and walked around all morning. 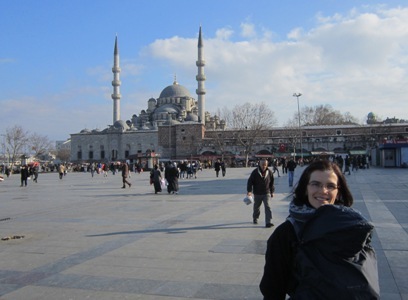 In the area is the New Mosque (over 400 years old), the Spice Bazaar, and the Süleymaniye Mosque. Quite a busy morning! 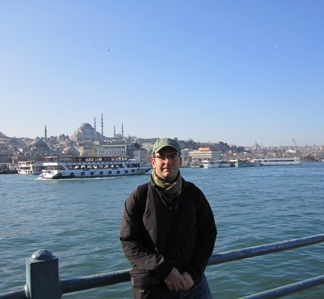 First up was to walk around the Galata Bridge. The bridge links the old and new sections of the European side of Istanbul across the Golden Horn. The structure you see today is pretty recent, but there has been a steel bridge with fish restaurants underneath for a very long time. It was a nice leisurely stroll and afforded some great views of the city. You can see Erynn and Greta in front of the New Mosque and Spice Bazaar (low brick building on the right). 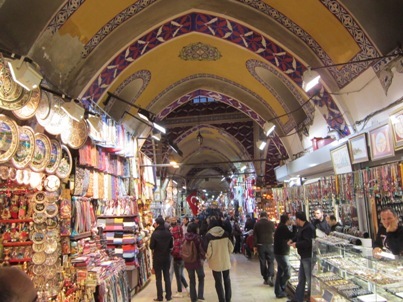 The Bazaar is also known as the Egyptian Bazaar since spices were normally imported from Egypt to the Ottomans. The structure was built from 1597 to 1664. 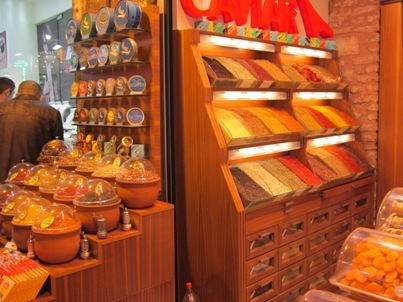 Here you can see the interior vaulted ceilings of the bazaar and a typical display of spices. 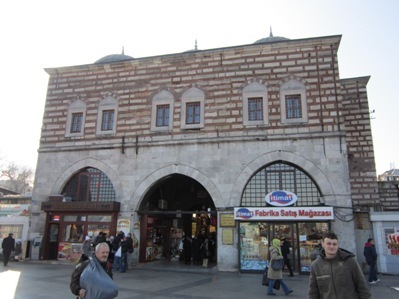 Along the exterior walls there were many stalls selling fish and a nice kebap place where we had lunch. As you can see, the recently refurbished interior is amazing. 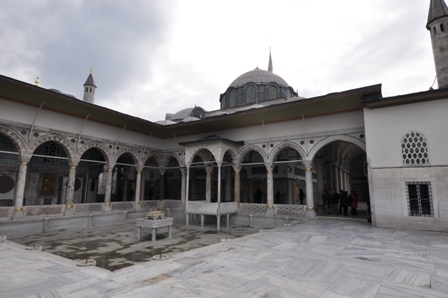 Upon the construction of the building the sponsoring sultan, Süleymaniye, claimed he has surpassed Solomon and his construction skills. 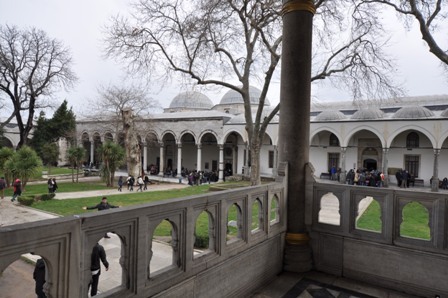 Just outside the main mosque walls was a nice grass covered courtyard that afforded some great views of the city and Bosporus. 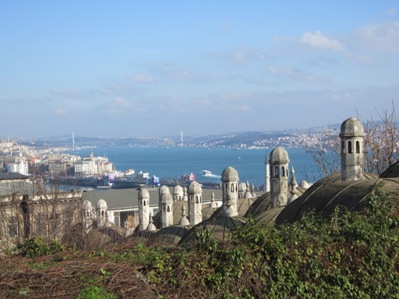 You can see the Bosporus Bridge in the background. It was also a nice opportunity for a family portrait! After 4.5 fun days in Istanbul we flew to Dubai for another 4 days in the sun. 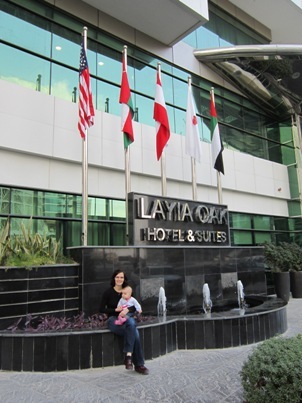 Our hotel, the Layia Oak Hotel was in the TECOM area, which is pretty residential (with some tech offices thrown in) and not particularly close to anything of note. However, we were able to get a full suite for a decent price on Expedia and it was only a couple minutes from the Internet City Metro station. We only had to take a taxi a couple times and avoided renting a car. If we wanted to go to the beach or a few other places we may have needed a car, but for what we wanted to do the place was perfect. 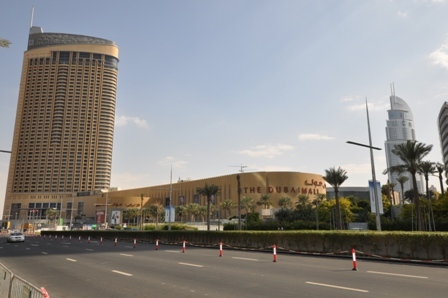 For some background, Dubai is part of the United Arab Emirates (UAE). Think of New York City, being part of New York State, which is then part of the United States of America, and you'll get the idea. So there's Dubai the city, Dubai the Emirate and the United Arab Emirates, which is comprised of seven emirates. Of the seven emirates Abu Dhabi is the largest and Dubai the second largest, and both are fueled by revenue from oil and gas. 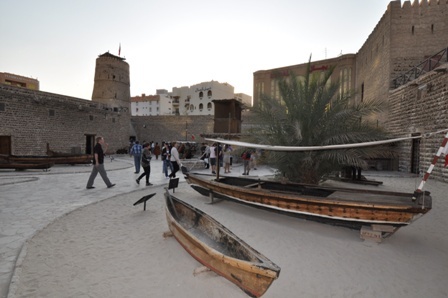 On our first day in town we headed to the Bur Dubai section of town along the Dubai Creek. 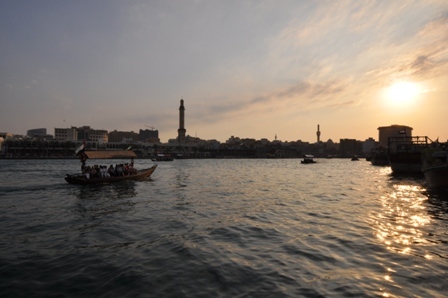 The creek was the center of life in Dubai for thousands of years before the discovery of oil. 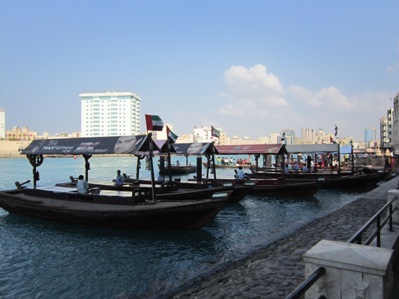 The area Bur Dubai is on the western side of the creek and Deira on the eastern side. The traditional way to cross is via water taxi. 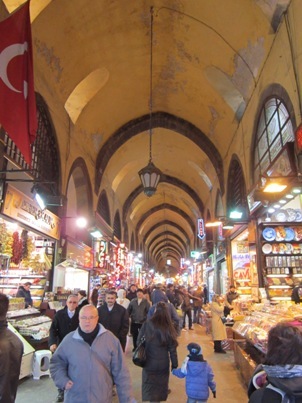 Also on both sides are a number of covered souks (markets). I've only put a few of the photos on this page. Remember that if you want to see a ton of high resolution photos from Dubai click here. 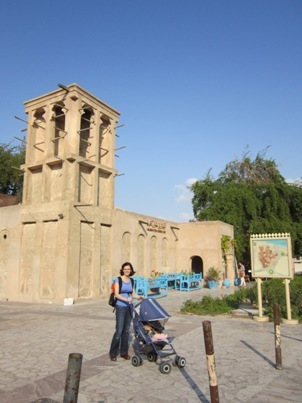 Our last stop in Bur Dubai was the Dubai Museum, which turned out to be quite interesting. The above ground facilities were interesting, but the exhibits in the underground gallery were great. 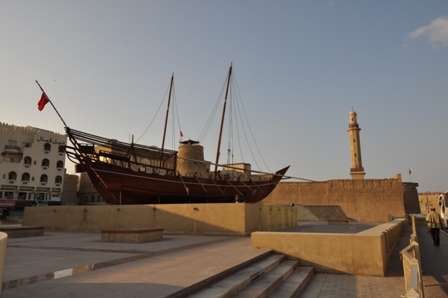 The museum explored everything from archeological discoveries, cultural backgrounds, and the development of the emirate. 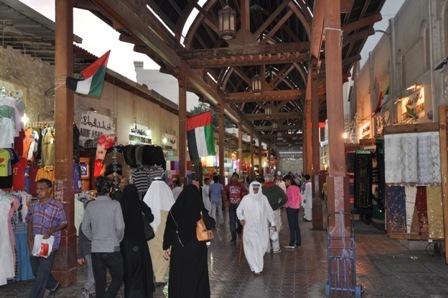 In the spirit of the souk culture, shopping in Dubai is like a sport. 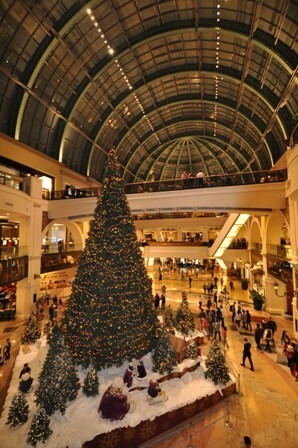 There are a number of huge malls and every brand known to man can be found there. 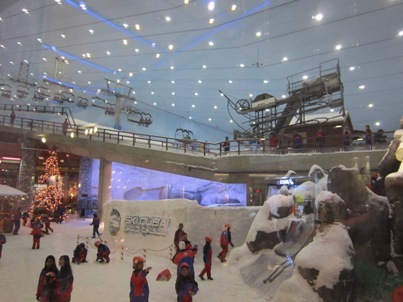 Our first mall experience was the Mall of the Emirates, which also contains Ski Dubai, an indoor ski slope. The other cool thing about Dubai is that a bunch of British tourists and ex-pats are there. It used to be a British colony... As a result the mall and grocery stores had all of our favorite restaurants and food from BOTH America and Britain. Heaven... to the point Erynn mentioned a few times so wouldn't be disappointed if we had to move to Dubai. 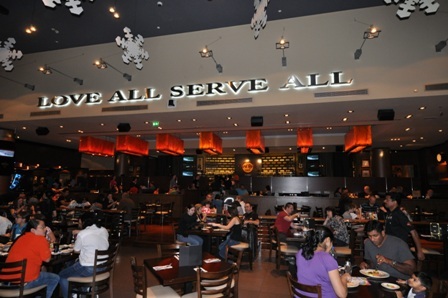 Dubai also has a Hard Rock Cafe in Festival City (another development along the creek) so we went and had lunch. It's hard to get really good salads in Germany, and the Hard Rock has really great salads. 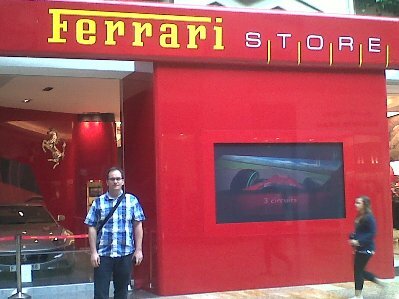 Plus, the Ferrari store next door made my buddy Joe uber jealous. While walking around the mall connected to the Hard Rock Greta fell asleep on my shoulder for the first time during the day. It may sound strange and is that it took six months for this to happen, but it's true. 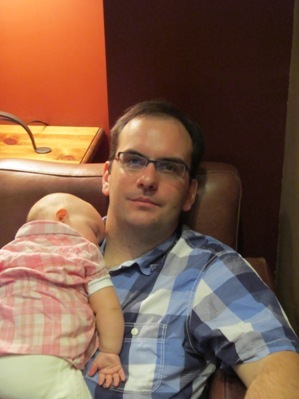 Usually she's pretty amped to be with daddy and is rarely sleepy. Bed time is another story. The picture on the right is probably my favorite so far of my girls. I took it right after Greta's nap. While Erynn was power shopping for Turkish plates and diamonds (more on that later) I was looking at camera gear. I walked into a shop and put on a Nikon 35mm f1.8 lens on my camera and turned and snapped this photo. Sold! The picture and lens are amazing. 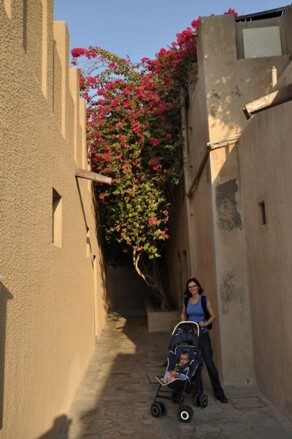 After Festival City, which is on the Deira (east) side of the creek we headed into the Deira Old City to visit the souks. 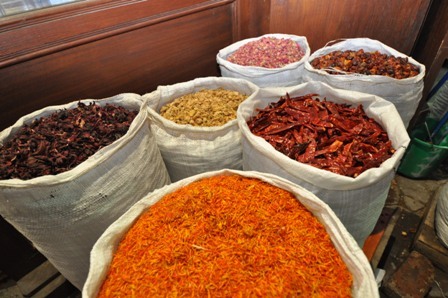 The spice and gold souks are the famous ones here. Above you can see the entrance to the spice souk. 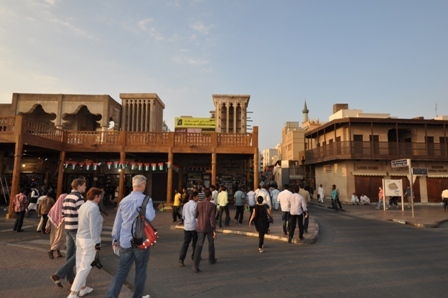 Now to the fun stuff... here is the entrance to the gold souk. And you can see in the right photo Erynn after her purchase of some nice diamond hoop earrings for Christmas. Very nice! 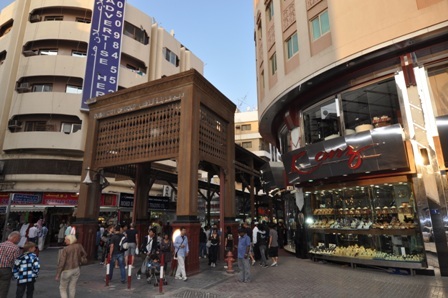 After walking around the Deira souks for awhile, we then headed to the Metro station and onto to our hotel. 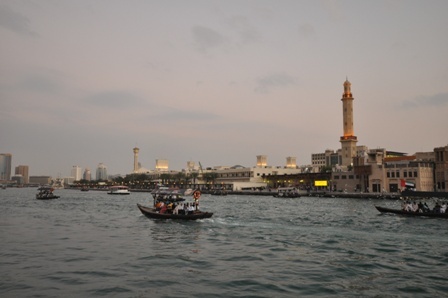 On the way back the sun was pretty good so I took a few more photos of the Creek and the Bur Dubai side of town. On our last day in the city we saved the best for last... 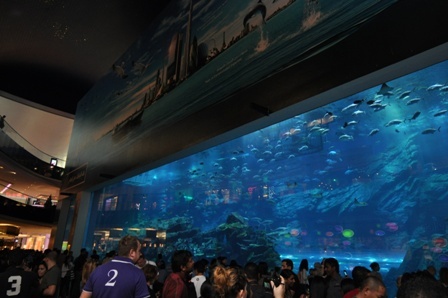 The Dubai Mall! The minor annoyances are that the mall is about a kilometer from the Metro stop, and an infrequent bus transfers you there. We walked. The taxi stand when we were there was about 200 people deep even with a steady stream of taxis coming. And the place is cool, but it's almost too big. You need to devote a couple hours just to walk around and that's not even counting stopping anywhere to shop. After a few hours in the mall we headed back to the hotel to rest up for our middle of the night flight back home. 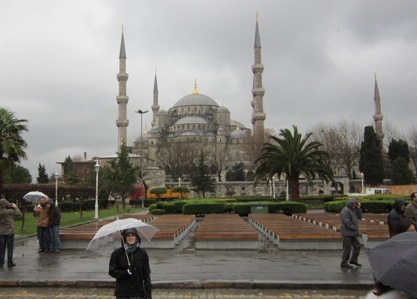 The summary of our ten day trip was that it was amazing and we only scratched the surface of both Istanbul and Dubai. 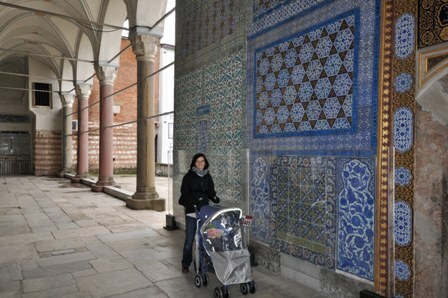 I think we hit most of the Old City stuff in Istanbul, but we didn't even some close to see everything in Dubai. We didn't even get to the beach -- mostly because it wasn't quite warm enough for Greta. They really are great places, and you should put them on your list.